The Four Aces Guitar Quartet is one of the new sensations of the Belgian music scene. The Four Aces Guitar Quartet played concerts in major halls in Belgium. Abroad they performed in the Netherlands, Germany, France, Slovenia, Italy, Georgia and China. In 2013 the Four Aces Guitar Quartet won Supernova, a Belgian chamber music competition that is supported by the national radio and tv-channel. The Four Aces Guitar Quartet brings concerts that make a combination of classical masterpieces and arrangements of traditional folk and pop music. These 4 young guitar players performed for the first time in Ukraine. They brought a refreshing programme, with a slight Ukrainian touch. Steve Schepens (°1979, Ghent, Belgium) is a contemporary visual artist, based in Brussels and Berlin (and formerly in Lviv). He organised several exhibitions in Ukraine and is well acquainted with its art scene. La Reine D’un Belge (The Queen of a Belgian) is an edible artwork. It is inspired by Schepens’ personal history and fascination with confiserie and baking (the artist grew up in the bakery of his grandfather in Belgium). It was first presented on the occasion of the King’s Day concert in the National Opera of Ukraine on 15 November 2015. The praline confiserie is a shaped candy with a filling. In Schepens’ oeuvre it is a metaphor for sculpture where both form and content add to the full flavour of the message. 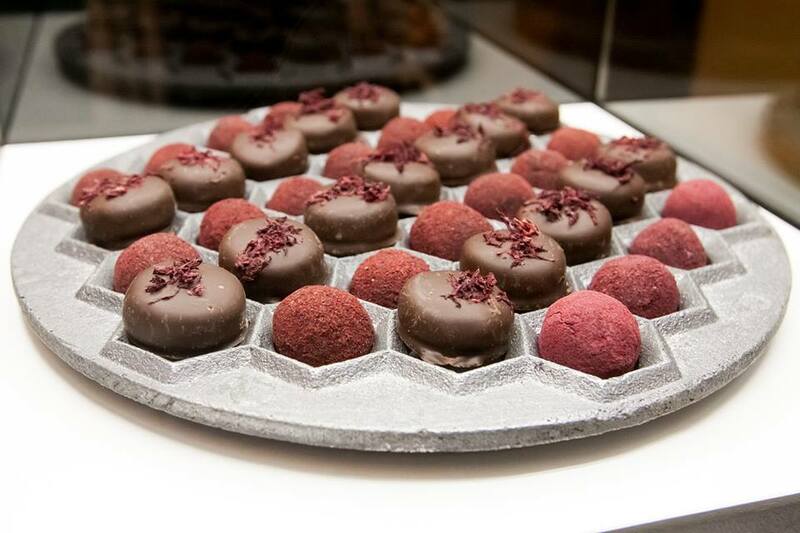 The main ingredients of La Reine D’un Belge are Belgian chocolate and Ukrainian beetroot. This harmonic fusion is an artistic and political statement. These musical and culinary delights also kicked off the «Journées de la Francophonie en Ukraine - 2017» . La Francophonie est plus qu’un ensemble de pays et de personnes partageant une langue. C'est surtout une communauté de destin défendant des valeurs universelles telles que la démocratie, les droits de l'Homme, le développement durable, l'éducation ainsi que la paix.